Off the bat I should tell you: I am a tremendous Morro and Jasp fan, and I looked forward to Morro and Jasp in Stupefaction like any kid counts down to an especially desirable event. I prattled on with glee the whole way to the new Streetcar Crowsnest theatre to my two companions about how much I have loved every single Morro and Jasp show I have ever seen. Here, then, is my dilemma. I cannot tell whether my general disappointment about the show I saw is based on being too attached to the previous shows, or whether there really was something about it that wasn’t quite on. It’s a very different kind of work in some ways than the previous shows. Not only is it more conceptual and more cerebral, but also there are three additional people onstage besides my (still-favorite) clown sisters. The extra people seemed somehow to break the seal of what I have always loved best about Morro and Jasp: the perfect tension between them. They needle each other, poke and prod, harry and challenge, but there has always in the past been a balance; a very small feedback loop. With the additional people, each of them has other people to perform their characters for — for Jasp to impress with her terribly mature behavior and for Morro to surprise with her antics. I…didn’t like it. Somehow, it seemed they both went way too far, to a polarized place that lost sight of the previous desire to have the other on their side, mostly. I liked the concept of the show, and I appreciated the idea, but I shifted uncomfortably in my seat most of the time. The three non-clown characters, however much I am concerned about their existence, nevertheless did solid work — especially Elliot Loran as the theatre usher with a longing for Broadway, who was adorably aggravated at the beginning and a True Believer by the end. 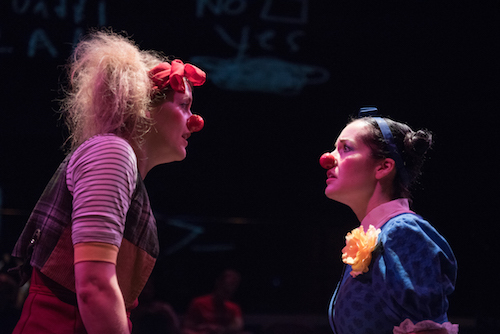 The technical whiz-bangs were mostly swell, and clowns Amy Lee (Jasp) and Heather Marie Annis (Morro) do lovely clownly work – great physicality, great focus. By the end, though, I was forced to conclude that Morro and Jasp in Stupefaction just wasn’t my particular bag of snack food. The clowns may have connected with the audience, but when I saw the show they didn’t seem very connected to each other. Morro and Jasp in Stupefaction, produced by Kabin and U.N.I.T Productions, is on stage until June 29th 2017 at Streetcar Crowsnest, 345 Carlaw Ave.
Showtimes are Monday through Saturday at 8 pm, with a 2 pm Saturday matinee.